When you write compulsively, people will tell you by way of encouragement or indulgence that you should write a book. The logic of it may not be quite clear, but it can be very persuasive all the same. I heard this and said it to myself over the years, lacking only a firm grasp on how to go about getting someone to publish my book, and an idea of what I would write a book about. At a preposterously early stage of my life as Christian I jotted some notes for a conversion memoir. But the longer I tried to live as a Christian, and the more absorbed in studying, preaching, and teaching my life became, the less interesting that sounded, even to me. My answers to “what made you become a Christian?” or “how did you become a pastor?” get more blurry and shapeless as time goes on. The day is coming when all I’ll be able to muster in response to that will be a shrug and a look of helplessness. But as I became less and less articulate about my own “faith journey,” I found myself more and more attentive to the things I was actually doing, and the people I was doing them with. I struggled with them, because those things and those people are interesting, beautiful, and difficult. A few years ago I pitched and then wrote a story about the Eucharist in a venue I’d never written for before. I involved eating a wafer that I had given to a dying woman, who was unable to swallow it (long story, read the link). This found its way to some lovely evangelical radio hosts in Pittsburgh, who had me on air to talk about it. One of them, in responding to my account, pointed out that it was, well, a little sick. Which, in fairness, it was. We do these gross, bizarre, seemingly pointless or at least unnecessary things. And I, a generally good and obedient secular subject, love them to the point of obsession. I watch other people just as at home in our world cleave to them, too. But why? How? And to what effect, if any, beyond our personal aesthetic and cultural enrichment? So that’s what I wrote a book about, following Luther’s seven “holy possessions” of the Christian people: Word, baptism, eucharist, confession and absolution, ministry, worship, and the cross. 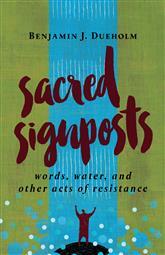 It’s called Sacred Signposts: Words, Water, and Other Acts of Resistance. You can buy it now and they’ll send it to you this summer. In fact you should definitely do that. With all due allowance for my particular originality and brilliance, though, it’s part of a larger Christian conversation about our distinctive practices and the role they play in resisting, or at least enduring, a secularizing age. It’s a topic Rod Dreher addresses in The Benedict Option, which came out when I was revising. I’ve written critically about Rod’s thesis (also here) and some of its practical implications. But I didn’t want to write a book-length response. Dreher asks good questions and provides useful answers, even if both are insufficient. I wanted to do something different. I wanted to talk about Christian practice in a secularizing world while keeping the eschatalogical urgency, and the radicalism of Christian identity, found in the Gospels in mind. Many people have envisioned a smaller, purer Church–one with harder boundaries between it and the world, and greater discipline and internal consistency within–as a way to cope with a “post-Christian” world. But there’s another way to look at it. If the Gospels are true, perhaps there never was a Christian age, and therefore no post-Christian one, either. Maybe the faithful witness and enduring practice does not require, or even allow, recreating the old Christendom on a smaller, local scale. Nor does it require, or even allow, unbounded eclecticism and hybridization. In my introduction I call these two camps “historical preservationists” and “dumpster divers,” both terms meant with some affection. Can we embrace our weird, gross, equivocal words and acts and deeds, and our shambolic community, more deeply and fervently without either closing ourselves off from an indifferent or hostile world, or surrendering to it piecemeal? I don’t think I’ve entirely convinced myself that we can or will. But I wanted to make the case that faithful Christian life requires us to try, and to hope. And to people who are mystified or repelled by what we do, I wanted to offer an account of why someone might want to do it. glad to hear, ben. I was wanting an update. i’ll look forward to the read.